Fig. 4. 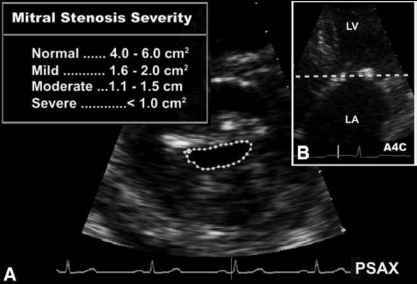 Apical four-chamber views of severe longstanding mitral stenosis in a 44-yr-old Vietnamese female. (A) Note marked thickening and calcification of mitral valve leaflets (arrows) and subvalvular apparatus accompanied by marked distortion in left heart chamber architecture. (B) This patient had severe pulmonary hypertension with grossly dilated right heart chambers and severe tricuspid regurgitation (arrow). ,„ 4.0 - 6.0 cm! Fig. 5. Measurement of pressure gradients in mitral stenosis. Tracing the continuous-wave Doppler velocity time integral (VTI) envelope across stenotic mitral valve gives maximum and mean pressure gradients. Fig. 6. Mean pressure gradient. 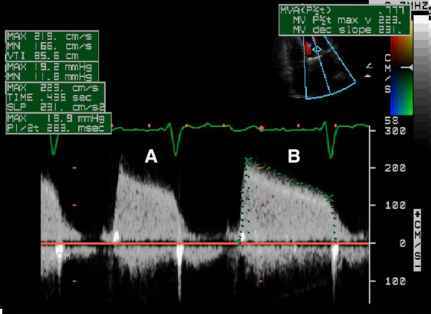 Continuous-wave Doppler patterns in a patient with severe mitral stenosis. Atrial fibrillation is present and is reflected in marked variation in the tracings as shown in A and B (mean gradient approx 12 mmHg). In such patients, gradients should be averaged over 5-10 cardiac cycles. Mitral valve area calculated by the pressure half-time method (Figs. 8 and 9) was ~0.8 cm2. A key caveat: pressure gradients are influenced by both the MV area, as previously discussed, and the amount of blood flow across the valve, as an increase in flow will yield a higher gradient for a given valve area. Therefore, using pressure gradients alone to estimate the severity of stenosis can be problematic. For example, it is possible to observe markedly elevated gradients with mild to moderate mitral stenosis in the setting of high flow (e.g., anemia) and to observe lower gradients with severe stenosis in the setting of low flow (although the latter example is more commonly an issue with aortic stenosis than with mitral stenosis) (Table 4). There are a number of ways to determine the MV area (Table 5). Fig. 7. Mitral valve area by two-dimensional planimetry. should run parallel to the valve orifice, as off-axis views will likely lead to an overestimation of the true valve area (Table 6). Also, image acquisition should occur early in diastole, as the valve orifice is maximally dilated at that time. The P1/2 is the time it takes for the pressure gradient across the MV to decrease by half (Fig. 8). The valve area is calculated using the equation, MVA = 220/P1/2 where MVA = MV area and P1/2 = pressure half-time (Figs. 9 and 10). This method correlates well with the invasive measurement of MVA. The concept behind the P1/2 method is as follows: the LV fills when blood from the LA crosses the MV during diastole. As the MV orifice area decreases, blood flow from the LA to the LV becomes increasingly compromised, and the time required for blood to flow from LA to LV becomes longer. This decreasing valve area is reflected in the length of time required for the pressure gradient across the MV to fall during diastole. The smaller the valve orifice, the longer it takes for the pressure gradient to decrease. In short, MV area is inversely related to the pressure half-time by the formula MVA = 220/P1/2. It is important to remember that what is measured is the time it takes for the pressure to reach one-half of the original pressure. Pressure and velocity are related by the Bernoulli equation (pressure = 4 x velocity2). 1. Atrial fibrillation. Although the P1/2 is largely independent of heart rate, if the heart rate for any given cycle is markedly elevated, a clear image of the pressure gradient fall may not be visible. Therefore, during atrial fibrillation it may be necessary to evaluate many beats (most labs assess at least 5 and often up to 10 beats). Fig. 8. 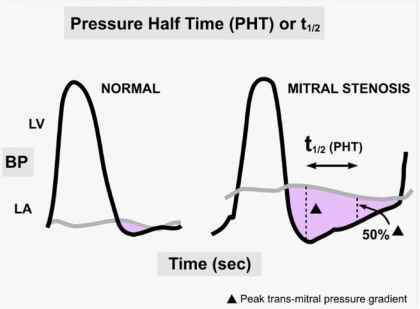 PHT measures how quickly the peak pressure across the mitral valve drops by half. Does the peak transmittal gradient drop quickly or does it take a longer time? The longer the PHT, the worse the stenosis. MVÂ7P«Ï3TË34 MV CEC slope SED. MV P^t max v 3 3 5. Fig. 9. The PHT is a reflection of the rate at which left atrial and ventricular pressures equilbrate during diastole. Mitral valve area is calculated as 220 divided by the PHT. conditions in which left ventricular end-diastolic pressure is elevated, such as restrictive cardiomyopa-thy or ischemic heart disease, the rate of equilibration between LA and LV is increased, and the estimation of MV area by P1/2 can also be falsely increased. Post PMV. A key assumption for this equation is that the P1/2 measurement is largely independent of LA and left ventricular compliance. After PMV, this assumption is not valid for approx 72 h as the chambers re-equilibrate. Therefore, during that time following mitral valvuloplasty, the P1/2 method is not considered valid. Fig. 10. Pressure half-time (PHT). Mitral stenosis can then be categorized as mild, moderate, or severe as shown. 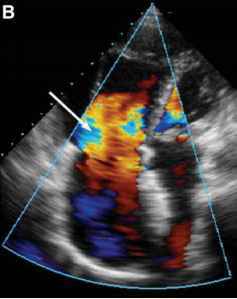 The PHT in this patient measured 187 ms—indicating moderate mitral stenosis. 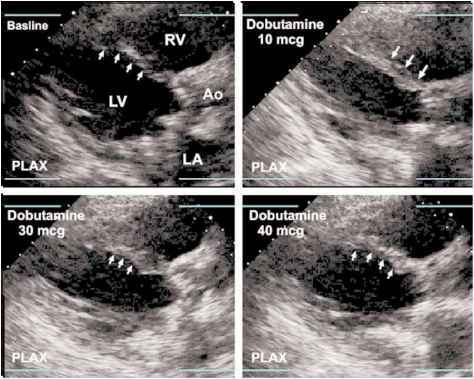 Changes that prolong P1/2, e.g., a chronically dilated and overcompliant left atrium leads to underestimation of MVA. MVA, mitral valve area; P , pressure half-time. LVOT, left ventricular out now tract; VTI. velocity time integral; T[ (pi) = 3.14 Fig. 11. 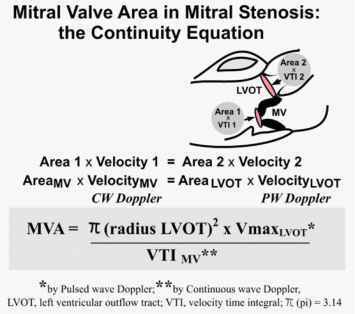 Continuity equation in mitral stenosis. LVOT ' AreaLVOT= VTIMV • AeaMV. Or, lvot/VTImv. This method correlates well with the invasive assessment of MVA. One key limitation of this method is that if there is regurgitation through the MV or the comparison point (e.g., aortic or pulmonic outflow tract), flow will not be the same at those two points (Table 8). Therefore, the estimation of the MV area may not be accurate. What do you measure in cw doppler in echo? How to calculate pressure half time from slope? How to measure pressure half time by echo? What can cause mitral valve pressure half time to be falsely low? How to measure mitral valve pressure half time? How to measure pressure half time mitral stenosis? How to measure mean mitral valve gradient? What is the equation for pressure half time? How to measure preasure half time? 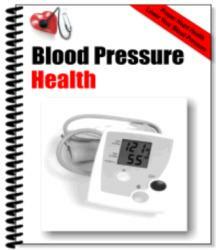 How to trace pressure half time for mitral stenosis? 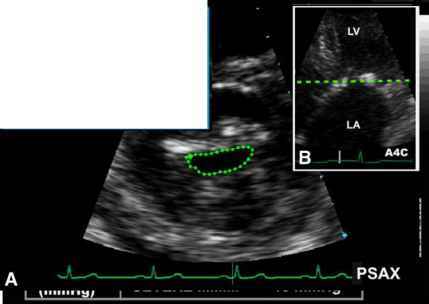 What is MV AREA PHT in mitral valve regurgitation? What is MVA (PHT) on Echocardiogram? What is mva peak volume in an echo? How to calculate pressure half time of mitral valve? What does it mean if you have an mva peak volume of 41 in an echocardiogram? How to calculate mv stenosis using peak half time and mva? What is pressure 1/2 time in echocardiography? Is MV Pressure Half Time of 50.09 normal? How to calculate mva by hand echo? How to calculate left atrial pressure by echo? How to measure MV area echo? How is the pressure half time obtained? How to get pressure half time for aortic regurgitation on echo machine? What is a normal mitral valve pressure half time? 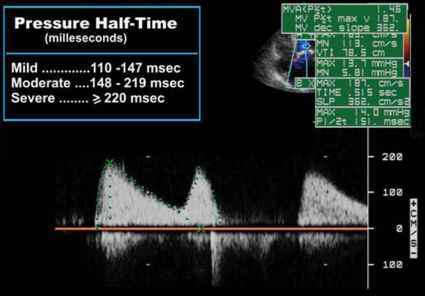 How to measure mitral valve pressure half time echo? How to measure mitra valve presure half time?